The Tribar bracelet design from Starlingear looks deceptively simple. With the Starlingear mantra of "if it was easy, everybody would do it", they chose to add a bit of extra challenge to their bangle project. 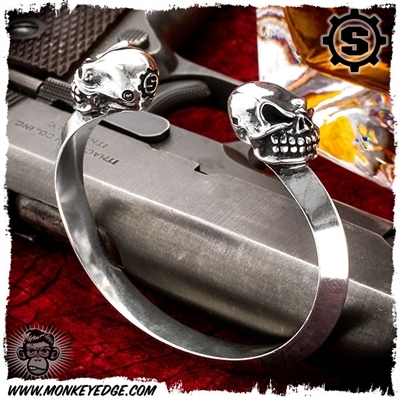 The bangle is made from triangle shaped solid sterling silver and then rounded and capped off with Slickster skulls. However, casting and working with that triangle bar is no small feat. These Tribar bracelets allow you to roll the S Gear in a bit more understated manner. These are the smaller variations, measuring 2.6 inches in inside width at widest point. Its interior circumference is about 7 inches. However, the user will have to custom fit them to their wrist either with a slight opening bend or closing bend to get that exact fit. To get a rough size of your wrist, take a piece of string, cord, or whatever and wrap around your wrist and get a measurement. To size: Get the piece slightly warm with heat gun or hot water. Then apply EVEN pressure (as in the same amount to both sides) to bend out or in to achieve final size.